It all started with this guy! Our little 3 wheeled black mobile coffee cart, who also goes by the name of 'Colin'. 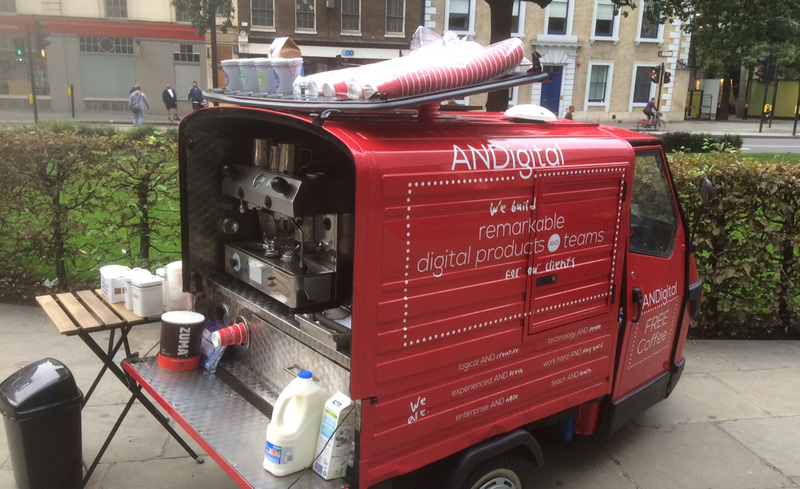 He has been a loyal and reliable servant from the start, providing thousands pf happy customers with freshly ground coffee at a variety of events. Our mobile coffee van is still our clients' most popular choice when booking us! From past experience, 'Colin' the coffee cart certainly has the wow factor, he is extremely compact but our customers love his overall look. He can operate under his own power, so can go just about anywhere. He measures just 2.5m long, 1.3m wide and 1.6m high! If you would like to hire a coffee / hot drinks service for your event then look no further, call us today on 07984184902 to book our mobile coffee van. Branding our mobile coffee van | cart is easy, we generally use magnetic decals. We can brand either half of the side or the full side. We can also brand both doors and the bottom trim of the coffee van side too. Alternatively for the wow factor why not wrap our little coffee van, its visually stunning - click here! The cost of this is £2400 inc vat. Call us to discuss hiring our mobile coffee van or mobile coffee trike or mobile coffee bar today on 07984 184 902.